Lafourche Parish is one of the oldest parishes in Louisiana and is located approximately 45 miles southwest of New Orleans. It combines a rural atmosphere with modern technology. It is one of the original nineteen parishes created from the Territory of Orleans on March 31, 1807. Early settlers explored a descending fork of the Mississippi River that mapmakers had named "LaFourche Des Chitimachas." 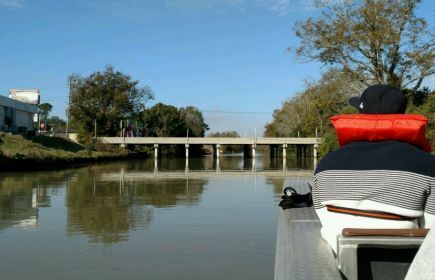 This distributary bayou, its name soon shortened to "LaFourche" served the early settlers well as a means of communication, a method of transportation, and a source of fresh water. The bayou was even used as a point of reference when giving directions. Today's residents frequently refer to a given location as "up the bayou," "down the bayou," or "across the bayou." It was not long before a close knit community of farmers and fishermen had extended the length of the bayou village settlement for many miles, building side by side. Control of the frequent bayou overflows played an important part in the early resident’ settlement pattern. Laws held each landowner responsible for the construction and maintenance of a bayou levee for his own protection and that of his neighbors. Land grants had a width of less that 600feet but with tremendous depth. Many farmers and plantations in the early 1700-1800’s had a depth of at least a mile and a half. A pattern developed consisting of a narrow bayou front farm with a long “ribbon” of land streaming behind it. Each had access to the bayou, and each had less levee to maintain. Historians, taking note of the unique pattern of housing development, with one residence after another lined up fronting the bayou for about 50 miles from Thibodaux to Golden Meadow, began referring to it as “the longest street in the world.” It is said that a baseball thrown from “front yard to front yard” could be started in Thibodaux and be in Golden Meadow an hour later. Isolation resulted when Lafourche’s residents took advantage of having the bayou for a front door and the swamp as their back yard. The bayou contained an unlimited food supply that could be eaten or bartered. The swamps and marshland contained abundant animal life which could be hunted for food or for their pelts.